To View the "Fun With Guests" Pictures from 2015, click on the red button above. What a great family reunion this was! Pauline and Will have been spending 2 weeks at Lloyd's Cottages every summer for 50 years! Their son, Bill, and grandkids, Chris and Melissa, all grew up spending their summer vacation with us as well. This year they all gathered along with spouses, and great-grandchildren for a wonderful week at the lake. They traveled from Pennsylvania, Oregon and Washington state. Such a great time was had by all. Terri, Karen, Kim, and Jill along with Alaina giving Audrey a lift enjoy a hot day floating around the lake. Meanwhile. lots of the kids get pulled around in the tube--the faster the better. 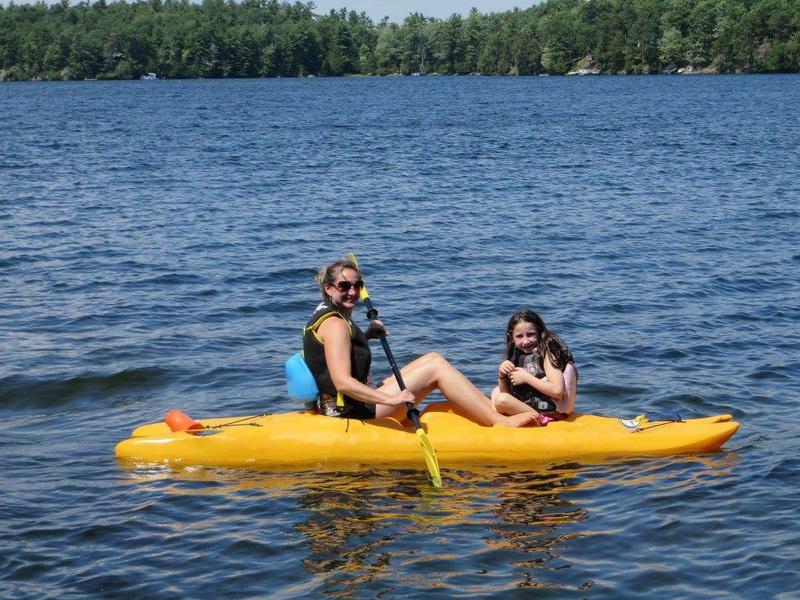 Then Paula with Audrey and Isaac try out the kayaks. The "beach sitters" spend time catching up after a long winter. Time for the annual corn roast and burger dinner at "The Cedars." After that everyone gathers around for ice cream sundaes. Yum! 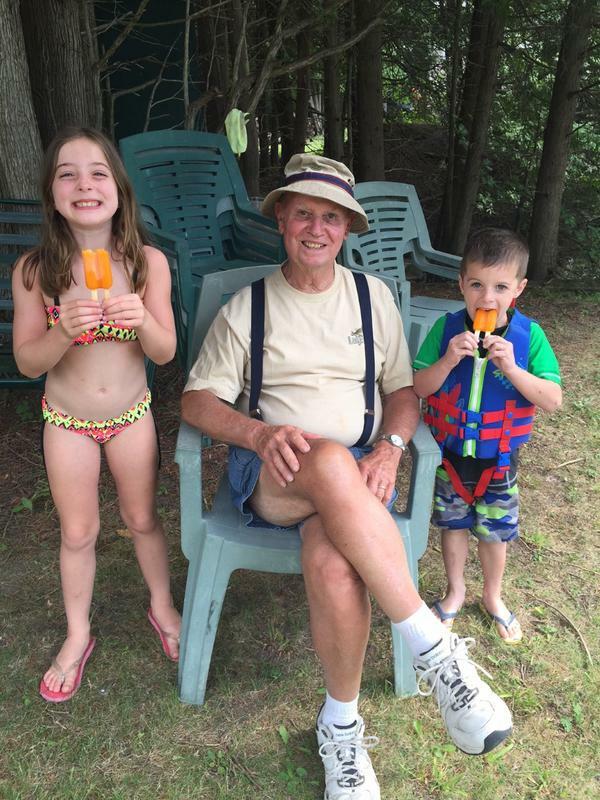 Ava and Tanner agreed to have their picture taken with Ed who gave them Popsicles! "Why Not" gets a face lift. Here we watched a couple new windows being installed. All hands on deck---literally! This whole gang showed up to renovate the deck on "Why Not" and to build a new railing. So then they decided that the old green picnic table had one or two rotten boards. This table was over 40 years old and had seen thousands of beers, drinks, snacks, lunches, games and just general camaraderie. Time for a redo! They started from the middle, upside down and worked out--one board at a time. By the time they had finished, the entire table had been rebuilt!! We never did figure out why they used the golf cart as the work bench instead of getting the usual work trailer. Just another crazy day at Lloyd's Cottages. As we have been saying for 50 years, without the help of our friends and guests, Lloyd's Cottages would never be what it is today. Every time something needs to get built or rebuilt or renovated, we could always count on tons of people to show up to lend a hand. So, once again, thank you.